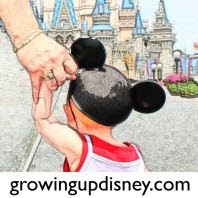 Natalie: My family regularly travels to Walt Disney World multi-generational. 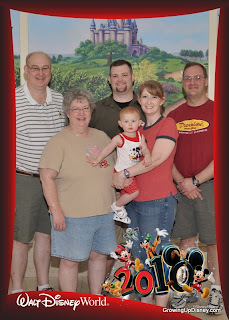 A typical vacation to Disney World includes my son, my mom and myself. The travels together allows us to go more often as we split the costs of the room and the food. My mom being with me has always allowed me the ability to ride the larger attractions while she and my son ride ones they are more interested in. After many (many) visits to the “World”, my mom decided that she would bring along my Grandmother for one of our adventures. My Grandmother was 88 at the time and was not up for the level of walking that any of the Walt Disney World theme parks requires. As such, we decided we would rent my Grandmother a scooter. We were able to rent from a scooter location which delivered the scooters directly to the Resorts. We also knew that she would not be able to get into the normal showers available at the Resorts. We spoke with Disney about our concerns and they said that they could accommodate us in a handicap room. We made sure to get assistance lined up at the airport in order to get my Grandmother from the car to the gate. This arrangement only required that we call our airline and request the assistance. With some apprehension, we all met up to begin our adventure. Once at the airport, we quickly found the assistance we needed to easily get my Grandmother to our gate. We had a wonderful flight to Orlando, then were again helped at the Orlando airport to get my Grandmother to our rental car. Once we arrived at the Pop Century, we picked up her scooter (which was a lot of fun to ride in!) and headed to our room. This trip included my son, mom, sister, Grandmother and myself. When we got to the Pop, we were told that we would receive two adjoining rooms with no charge for the second one! We found our room and were pleased with the amount of space we had. My Grandmother was quickly a pro at using the scooter, much to her surprise. We had a wonderful day in EPCOT. She decided that she must see Mickey Mouse and off we went to find him. We had a great time there during our visit. In fact, Mickey loved my Grandmother so much, he tried to leave with us! All of us had a great time there together. It was fun to be able to experience EPCOT with my Grandmother and other family members. It is an experience I will cherish for my lifetime! 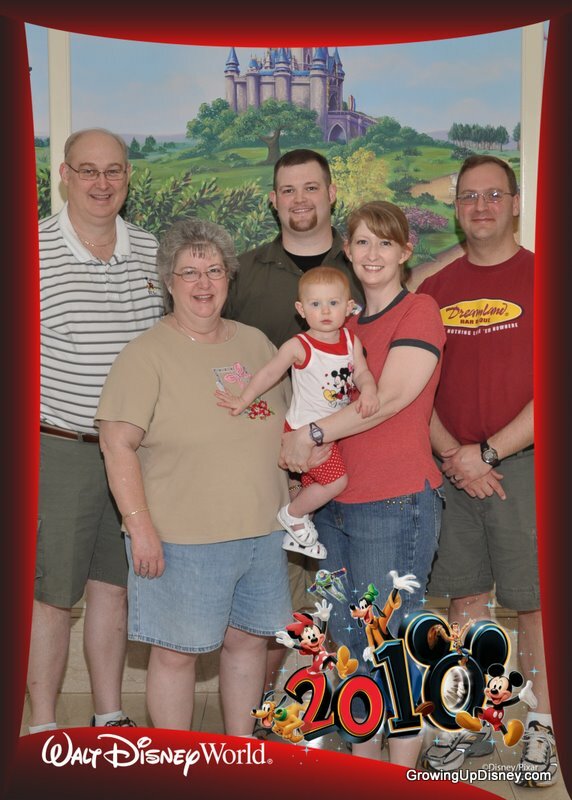 Beth: Our trips to Walt Disney World are always multigenerational, large family outings! What once was a trip with just four of us, my parents, my brother and I, have now become trips with over ten people with my parents, my brother, my sister in law, two nephews (soon to be three), my three children, my husband and myself. Traveling with such a large group certainly creates some of the most magical moments, but these trips do require a little extra planning and a little compromise on all sides. As our family has grown, we have learned plenty of valuable lessons about traveling as a large group. This is so important when traveling as a large group. Of course the point of the trip is to spend family time and share in all those special Disney moments, but plan some time for the family to split up during the day and meet up for dinner, or spend the day together and then have dinner alone. This gives everyone the opportunity to do exactly what they want to do. Even though it is the happiest place on Earth, even in Disney, everyone has their own special things they want to experience. When planning a group vacation, select one person as the leader. Of course, I am lucky because no one in my family wants that job, so much to my delight, I get to be the organizer of the trip! Just because someone is chosen to lead the group, it is still a family vacation, and everyone should have a say in the decision making. The leader is just the point person to keep all the details organized and keep everyone informed of what is going on. They should not dictate what will happen on the vacation. The biggest lesson we have learned traveling as a large group is that we need to compromise. If one person is dictating the entire trip, some of the favorites of others will be overlooked. Have your list of “must dos” for all the family members and make sure those things are experienced first. I cannot imagine our trips to Walt Disney World without my entire family. When we first started traveling with children, we were not prepared and made a few mistakes along the way as far as listening to everyone’s choices. But with a few of these full-family trips under our belt, we have created some Disney memories that will last us a lifetime, and I look forward to making many more! Amy: As a Disney Vacation Club family, it seems like we have more often than not traveled with other people. Grandparents, aunts & uncles, cousins, friends, in-laws, and about 8 years ago some guy who's last name I now have started tagging along. Now a trip to Walt Disney World will usually include myself, my husband, my two young daughters, my parents and my brother. The biggest thing I have learned over the years is to split up. A whole mess of people can't stay together all day unless you are wearing matching soccer shirts and following a chick with a small flag. Walt Disney World has more attractions, entertainment, shopping and dining than you could possibly take in during one trip and these often appeal to different parts of your party. Dividing the group from time to time allows for the thrill-seekers to head off to Space Mountain while the less adventurous enjoy a leisurely ride on the Peoplemover. We have found in the past that group meals are a great time to bring everyone back together. We'll head out in our different directions in the morning and then meet up in the afternoon for a late lunch. Everyone gets a chance to get out of the heat and we can all chat about the day's adventures. We'll usually visit an attraction or two all together after that and then we split up again. Now that we've started taking little ones, the game plan changes just a bit. Yes, we still split up but not as much. Granny and Granddaddy want to spend time with the grandkids since they don't live nearby. It works out really well for us. Little ones are happy playing in a fountain or just running around and my parents have seen it all a million times and don't mind missing out on the headliner attractions. 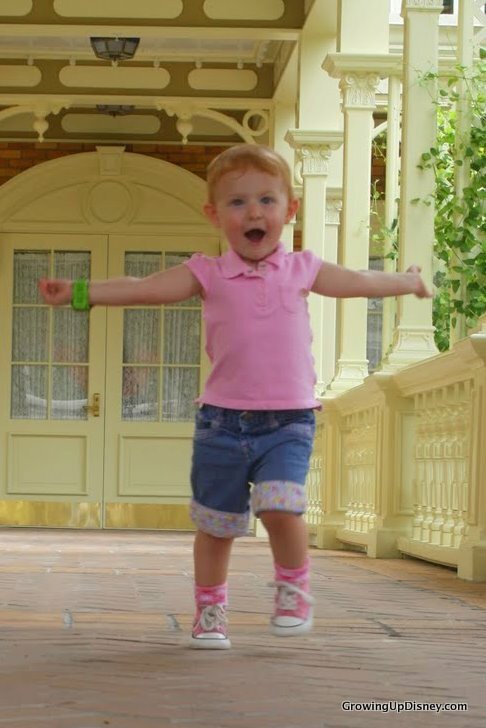 Not that they don't love Disney, it's just that watching your grandchild play at Disney World is really magical. And built-in babysitters mean we can also work in a date night and the 'big kids' in our group can enjoy a few E-Ticket attractions. My family has been going to WDW together for a long time. We know the drill. Don't assume that other people you bring along know how you like to vacation or that their vacation style is the same as yours. You will be highly frustrated if you do. If your family likes to be at the park of the day for rope drop but your new travel companions would be happy to cross the turnstiles by noon, you need to discuss this in advance. Again, this gives you a chance to split up and not have too much "togetherness." It can be hard to coordinate everyone's usual schedule when you travel as a group. Just know that little ones are going to stay up later than at home. And grown ups who are accustomed to more flexible meal times will need to accommodate the children. If everyone gives a little, you'll have a good time. Oh, and be sure to take lots of pictures using Photopass. You never know when they'll capture a great memory of your whole bunch. Thanks to Natalie from Meet the Magic and Beth from Pursuing the Magic for joining me on this post. We'll have more from the Minnie Moms on this topic so stay tuned. I LOVE this post! We have never traveled with less than 10 people in our group..but our trip in just 24 days will be with 7 people which is super easy for us...lol. I agree with everything that you said but the only thing that we do different is that we stay together for everything. I know that is virtually impossible but it seems to work for us. Love traveling in a large group! !